These easy and healthy chocolate almond truffles are made with almond butter and dates for a paleo spin on an indulgent classic. They make a great Valentine’s Day treat! We haven’t really created many holiday traditions in the 6+ years we’ve been married. I guess it’s a combination of the lack of kids thing, spending 2 of the 6 Christmasses (is that even how you make that word plural? Idk…) traveling when we lived in Florida and then Ulysses not really ever wanting a tree or being very festive in general. But 4 years ago my mother in law started sending us the Godiva special edition tin full of chocolates for the holidays and honestly, I’m not sure I could even think up a better tradition than that. The tins are gorgeous. Every year the design changes and they’re seriously a work of art. I couldn’t care less about art (I can pretend to be interested inside an art museum for all of about 5 minutes before turning into a whiny 4 year old) but I look forward to seeing what they’ve come up with each year when the package comes. Obviously, they’re filled with chocolate too. 3 tiers of mostly dark chocolate. But the best part is by far the 2 or 3 little spaces per tier where those dark truffles are. This year’s tin came last Monday and I patiently waited 4 more days until Ulysses got home to open it. He came home Friday night and within 5 minutes it was opened and he was eating one. I happened to be in the bathroom when all this occurred, came out and saw a missing chocolate in the spot that normally belongs to one of the truffles (I have the layout memorized). I tried to keep my cool and casually ask which one he ate when he turned around with half the dark truffle in his hand so I could see him pop it in his mouth right before answering me. In an attempt to salvage some optimism from the situation, I asked if it had the dark black lines or the brown lines on it (the brown lined ones being milk chocolate and obviously lowering the truffle eating offense by a few percentage points). He said dark and that’s when I wanted to cry. So I decided I’d make my own truffles. Ones that Godiva would probably laugh at with the base being dates instead of chocolate but at least they won’t make me cry when a certain spouse pops them all nonchalantly into his mouth like we haven’t been waiting 364 days for their arrival. And that’s how these chocolate almond truffles came to be. I’m pretty in love with dates (I could eat them stuffed with almond butter all day long and be happy) but I’ll admit to being sort of skeptical as to how “truffle” like I could really get them when I started whirling these around in the food processor. Apparently something magical happens when you combine dates with almond butter, coconut butter and almond extract. I don’t know what exactly, but it gives Godiva a run for its special edition tin money in taste. And oh yeah, these chocolate almond truffles? They’re freakin’ healthy to boot. 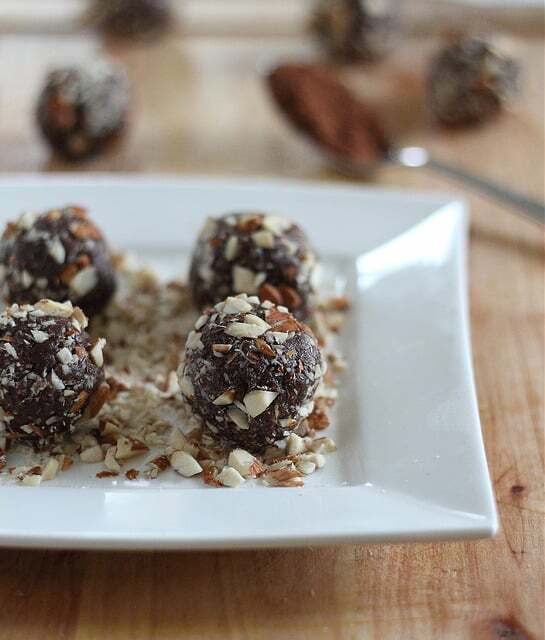 Want more recipes like these chocolate almond truffles? Try these Coconut Almond Butter Truffles or my personal favorite, these Dark Chocolate Kahlua Coffee Bites – don’t let the name fool you, they’re every bit a creamy, chocolate truffle! All of these would make a great dessert for Valentine’s Day too! Grab more recipes for Valentine’s Day! These easy and healthy chocolate almond truffles are made with almond butter and dates for a paleo spin on an indulgent classic. They make a great Valentine's Day treat! Combine dates and extracts in a food processor and process until coarsely chopped. Add the almond and coconut butters and process until fully incorporated and mixture becomes smoother. Add remaining ingredients except the chopped almonds and process until mixture is sticky to the touch and able to easily roll into balls. Roll into tablespoon sized balls and set aside. Put chopped almonds in a small dish and roll truffles into nuts. You'll have to sort of press the nuts into the truffle for them to stick. Place on a plate and refrigerate for about 30 minutes so they firm up a bit. Store them covered in the fridge. These truffles are perfect, better then any godiva chocolate! I’ve been wanting to recreate some chocolate truffles this year, but honestly I have been to lazy to think of a recipe, I guess my mind wasn’t in it, but you did all the leg work for me! Going to make a batch of these tonight. They look delish!! Nice work with these! They look very truffle-like. I too could eat almond butter and dates until the end of time. It’s usually they snack I have right before yoga. I like dipping the date in almond butter then coating it in ground flax. Hubba hubba!! a ground flax coating?! genius! Oh my…these sound delish! I love dates, too! I am constantly experimenting with date and nut balls, cocoa etc, but I’ve never added coconut oil, genius! They look amazing. Mm check out these beauties! :) These look and sound amazing! This will be my first Christmas on the GAPS diet, but I can have dates … seriously, you have saved my life with this recipe! Thank you SOOOO much! Love your blog! I grew up in Southern California and had relatives in Coachella. 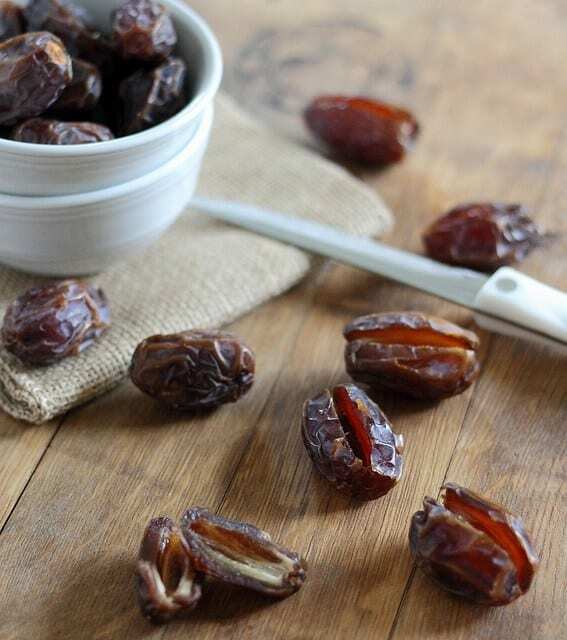 So one thing we always had plenty of were dates. I grew so sick of them as a kid that I haven’t had one in years. But these little beauties may convince me to change my mind! 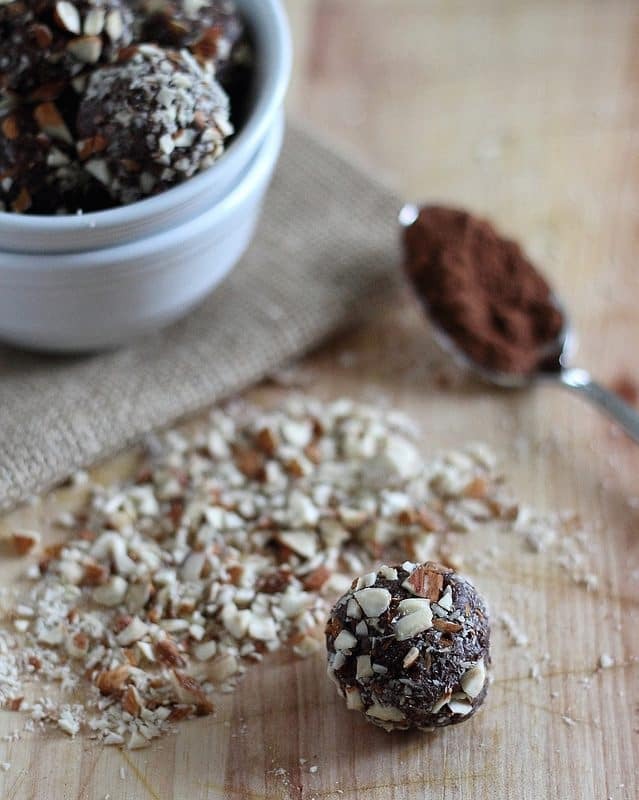 I love a good no-bake cocoa powder + medjool date ball! Peanut butter, almond butter, cocoa butter, coconut – can’t go wrong adding any of them. I love all those combos. I have eaten more than one or two Godiva truffles in my life and if these taste like Godiva, I’m sold! Love that you used dates in these – what a great way to get that truffle texture without all that butter and cream. They sound really delicious! Hmmm…wonder if I could gift these this year and pull one over on the fam? I have a giant bag of dates in the pantry with a new destiny: truffles! I made these last night – sooo good! I didn’t have any almond extract so used rum extract instead – who doesn’t like a guilt free rum ball :) Thank you! I decided to add these babies to my Christmas cookie bake-a-thon last night, and boy am I glad! These are truly the most delicious treat! I love the ingredients too…just a bunch of good stuff. My husband thought these were the best of the baked goods. Thank you! I love making truffles too, and these are healthier than the average. Love it. I bet these are full of so much flavor!! They look and sound amazing!